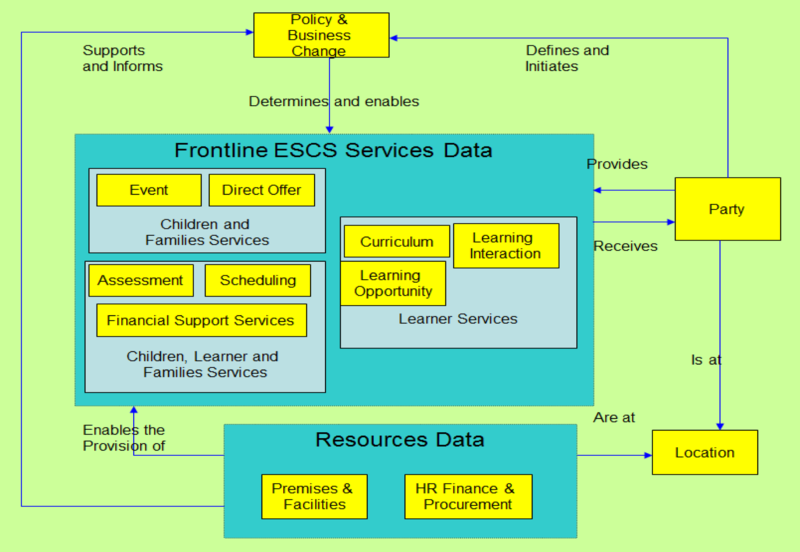 This is the new Business Data Architecture from the Education, Skills and Children’s Services (ESCS) system, published by the Information Standards Board (ISB). It is more than a year since Quarkside reported better relations with the Systems Interoperability Framework (SIF) parallel standards. The good news is that there have been changes as a result of better communications. It appears to show a better understanding of the processes that operate within schools. It may only seem to be a small change from ‘Stakeholder’ to ‘Party’. But it make more practical sense. Most people in school administration do not consider themselves as stakeholders, whereas they all like a party. It must have been a brave change, owing to the enormous number of places the word had to be replaced in the Standard, which has now grown to 246 pages. Give them a round of applause for perseverance over the years. The spat between the Systems Interoperability Framework (SIF) Association and the Department for Education started last August with a flawed consultant’s report to DfE. The riposte from the SIF Association showed concern about “the numerous inaccuracies in the published review” was sent in September. There was no satisfactory response by the time of the November SIF Conference. The demise of Becta can’t have assisted the proceedings, but it has taken another four months to get any public form of rapprochement. Whether it all leads to greater efficiency in education administration, only time will tell whether it is a marriage made in heaven. The inaccurate and misleading Interoperability Report has not been withdrawn by DfE, in spite of diplomatic attempts to correct the record of the SIF (Systems Interoperability Framework) Association. The outrage became apparent at the recent conference of the educationalists and suppliers that have built up the only practical interoperability solution. Their methods demonstrably reduce the burden on school administrators, teachers and local authorities in operational and analytical duties. An anodyne response from a minister (Lord Hill of Oareford, CBE) has done nothing to deflect the damage caused by the report. One rather embarrassed conference attendee had a sticker, “The DfE Interoperability Report had nothing to do with me”. It transpired that the Information Standards Board (ISB) members and technical advisors had not seen a copy of the report when it was published. I must apologise for mistakenly thinking that the ISB was part of the problem. They may have issues about adequate representation across the whole education sector – but that’s another story. Evidence has been gathered of public sector bodies believing the inaccurate report and using it as the reason for not adopting SIF. The SIF Association made 13 rebuttals on inaccurate statements – none have been adequately answered. One wonders if part of the reason is that the commissioner of the report has left the DfE and that the authors (CapGemini) have received adequate payment; neither seem to have any further interest in correcting it. It is not stretching credulity that the report is impacting the commercial prospects of SIF suppliers. Worse than that, opportunities to improve outcomes and efficiency in schools has been severely damaged.